01. go to disneyworld. this is pretty much already planned and paid for by my lovely parents, who are just as excited as me (if not more than). i can't bloody wait! i went in 2009 and it was the best 2 weeks of my life. i'm sure this time i'll appreciate it more and live the experience to the full, starting with going on the aerosmith rock 'n' rollercoaster, which i was too scared to go on last time i was there. 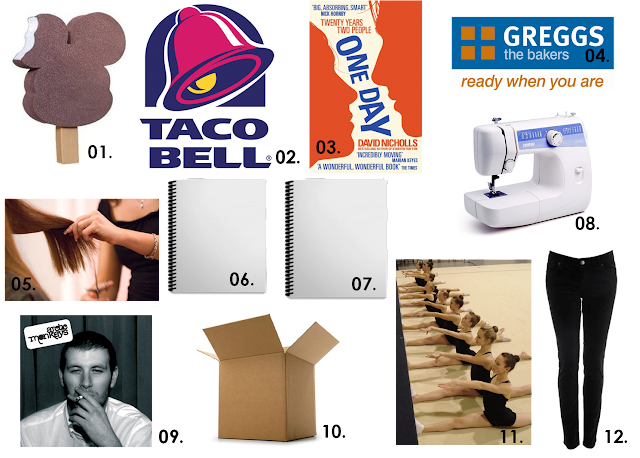 02. try taco bell. one has opened in manchester recently but i'll be trying it in the sunshine state and paying with dollars. i've already planned what i'll be ordering and i'm really excited. 03. read at least 10 books. i recently ordered about 6 books from ebay so hopefully this'll get done, but i'm really busy with coursework and things so maybe this is a bit of an ambitious one. there'll be book reviews to come! 04. don't spend money on food when i have food from home in my bag. i spend way too much on fast food when i'm at sixth form. the call of greggs sausage rolls are just so tempting but i must resist. 05. have my hair cut. i last got my hair cut in june 2011 for prom (and they totally butchered it) and i don't really like the whole hair salon experience. on the other hand, i don't want to look like a tramp in florida, so it has to be done. 06. try really hard with my art alevels. one year, one alevel, a hell of a lot of work, but i need to do it and i know i'll be so relieved when i pull a good grade out of it. i know it'll be hell, but ya know, you gotta do what you gotta do. 07. sketch in my own time, for myself, away from sixth form. pretty straight forward. 08. use my new sewing machine to make at least one thing. i'm planning a cute shift dress but i need to find fabric and a pattern. 09. listen to some new music. i've got all of the arctic monkeys albums on my 'to download' list. 10. clear out my room and put some things in the loft. my room is full of stuff that i don't need and don't use but i'm so bad at tearing myself away from things i own, so i need to empty everything out. 11. continue with split training. i starting doing split stretches everyday again in november. being able to do the splits is something i've wanted to do since i was little and i think it's time that i get it done, and not give up this time. You really, really need to read 'One Day'!